Convert High-definition (HD) videos (incl. AVCHD (*.m2ts, *.mts), H.264/MPEG-4 AVC, H.265/HEVC, MPEG-2 HD, MPEG-4 TS HD, MPEG-2 TS HD, Quick Time HD, WMV HD, AVI HD) on Mac. Convert Standard-definition (SD) videos (incl. AVI, MPEG, WMV, MP4, H.264, MOV, FLV) on Mac. Convert normal 2D videos into breathtaking 3D format and play them on your Mac, 3D TV, etc. Extract audio from videos; convert popular audio files; turn pictures into videos & vice versa. Works with iPad, iPhone, iPod, Apple TV, PSP, PS3, Xbox360, Zune, PMPs, Google phones, mobile phones & many others. Now fully support Mac OS X 10.11 EI Capitan. Looking to convert all your normal videos in your Mac to 3D videos? Look no further than ImTOO Video Converter for Mac. This versatile Mac video converter can convert between nearly all HD and SD format videos, and convert them into 3D videos with amazing image quality. Among the many video formats supported by this great Video Converter for Mac include AVCHD (*.m2ts, *.mts), H.264/MPEG-4 AVC, H.265/HEVC, MPEG-2 HD, MPEG-4 TS HD, MPEG-2 TS HD, Quick Time HD, WMV HD, AVI HD, MKV, H.264/AVC, AVI, WMV, MPEG, MP4, MOV and many others. It can also work as an audio converter to convert between all popular audio files such as MP3, WMA, AAC, WAV, CDA, OGG, APE, CUE and so on. ImTOO Video Converter for Mac supports most multimedia devices including the iPad, iPhone, iPod touch, Apple TV, PSP, PS3, BlackBerry, Zune, Archos, iRiver, Creative Zen Vision, Xbox360, Google phones, and mobile phones. In addition, you can also edit your files by clipping/merging/splitting/cropping, adding watermarks/soundtracks/effects using this perfect Mac video converter. Try it for FREE now! Convert most HD videos including H.264/MPEG-4 AVC, H.265/HEVC, AVCHD, Apple TV H.264 720P, MKV, HD WMV, MPEG2/MPEG-4 TS HD Videos to different HD/SD videos for Mac users. Convert between video formats (AVI, MPEG, WMV, DivX, MP4, H.264/AVC, MKV, MOV, etc. ); convert between audio files (MP3, WMA, WAV, M4A, FLAC, APE, etc. ); extract audio from video files. Turn images into videos; extract images in batches from videos. Crop the video frame to retain what you want; adjust/add video effects; add watermarks to label your video; add audio track to your video. Clip segments from video then optionally merge them together; merge several video clips together with transitions inserted. Support Mac OS X 10.8. Supports 3D video conversion function. Supports preset parameters: Ultrafast, Superfast, Veryfast, Faster, Fast, Medium, Slow, Slower. Transfer converted files directly to iPod, iPhone, iPad and PSP after conversion. Convert standard video to 3D video, also convert format between 3D videos. Support video shot by nearly all kind of DVs. Introduce unique transitions in between merged picture/video items. With ImTOO Video Converter for Mac you can add audio track to videos. Comes with optimized conversion profiles for all popular multimedia devices including the iPod, iPhone, Apple TV, PSP, PS3, BlackBerry, Zune, Archos, iRiver, Creative Zen Vision, and Xbox. Convert multiple files at super fast conversion speed simultaneously with batch processing and multithreading. Output source file into multiple formats simultaneously. Split a large file into several by customized split time or size. Compute the output file size and its video bit rate with the built-in Bitrate Calculator. Preview the edited video and compare it with the original side by side in real-time. Take snapshots of video images whilst previewing. Adjust a wide range of output parameters including bit rate, frame rate, zoom, sample rate, split mode and many more. User interface available in English, French, German, Spanish, Italian, Portuguese, Japanese and Chinese. Window Mobile device: Pocket PC, Dell Axim X51, HP iPaq hw6500 series, etc. Tutorial : How to convert video files with Video Converter Ultimate for Mac, Video Converter Platinum for Mac, or Video Converter Standard for Mac? Powerful YouTube Converter for Mac helps you download and convert YouTube videos to popular video formats. 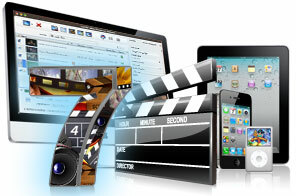 Convert all popular videos to MP4, MPEG4, MPEG4 AVC for your iPod, iPhone, PSP, etc. on Mac OS. Convert HD videos like AVCHD(.mts, .m2ts), H.264/AVC. etc. on Mac OS with high quality. Convert DVD on Mac and convert DVD to various video and audio formats.